What Is a Floppy Disk Drive? Sabrent External USB 1.44 MB Floppy Disk Drive. The floppy drive is a piece of computer hardware that reads data from and writes data to, a small disk. The most common type of floppy drive is the 3.5" drive, followed by the 5.25" drive, among other sizes. The floppy disk was the primary method to transfer data between computers and back up files externally, from the late 1900s all the way up to the early 21st century. For the most part, the floppy disk drive is now completely obsolete. This older storage device has been replaced by other portable devices and built-in computer hardware not only because they're more common and therefore compatible with other devices, but because they're more capable and can store much more data. The optical disk drive used for DVDs, CDs, and Blu-rays, is one commonly used piece of hardware that has replaced the floppy drive. The floppy drive goes by other names too, like floppy disk drive, disk drive, floppy diskette, diskette drive, 3.5" drive, and 5.25" drive. 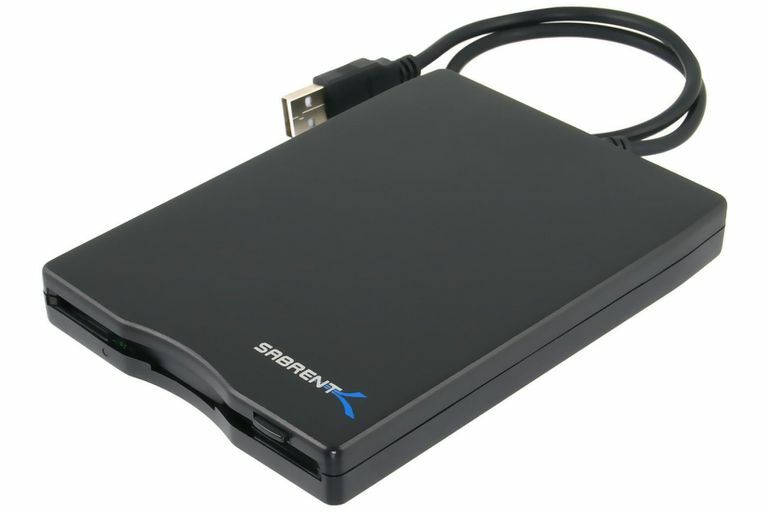 While still a component of some existing computers, floppy drives are essentially obsolete, replaced by inexpensive flash drives and other portable media drives. A floppy drive is no longer standard equipment in new computer systems. Traditional floppy drives that install inside of a computer case are becoming less and less available. Typically, the best option for using a floppy disk on a computer that doesn't have one, is with an external one, probably USB-based like the one pictured here. USB floppy disk drives interface with the computer over a USB port and function much like any other removable storage device, like external hard drives and flash drives. A traditional 3.5" floppy drive is about the size and weight of a few decks of cards. Some external USB versions are only slightly larger than floppy disks themselves. The front of the floppy drive has a slot to insert the disk into and a small button to eject it. The sides of the traditional floppy drive have pre-drilled, threaded holes for easy mounting in the 3.5-inch drive bay in the computer case. Mounting is also possible in a larger 5.25-inch drive bay with a 5.25-to-3.5 bracket. The floppy drive is mounted so the end with the connections faces inside the computer and the slot for the disk faces outside. The back end of the traditional floppy drive contains a port for a standard cable that connects to the motherboard. Also here is a connection for power from the power supply. An external floppy drive will only have whatever connection is necessary to hook it up to the computer, usually a cable with a USB Type A connector. Power for an external floppy drive is derived from the USB connection. The floppy disk holds an astonishingly tiny amount of data when compared to newer technologies like SD cards, flash drives, and discs. Most floppy disks can only support 1.44 MB of data, which is smaller than the average picture or MP3! For reference, a small, 8 GB USB drive can hold 8,192 MB, which is more than 5,600 times the capacity of a floppy disk. What's more is that 8 GB is on the low end when it comes to portable storage. Some really small USB drives can hold as much as 512 GB or even 1 TB or more, which goes to show just how outdated the floppy disk really is. Even SD cards that can fit inside phones, cameras, and tablets, come as large as 512 GB and bigger. Many desktop and laptops have a disc drive for loading or burning software installation discs, DVD videos, music CDs, Blu-ray movies, etc. The CD allows for 700 MB of data, the standard DVD supports 4.7 GB, and the Blu-ray Disc can manage upwards of 128 GB if it's a quadruple-layer disc. Internal drives have been gradually phased out of laptops in favor of USB connected solutions. Although it isn't fair to compare such outdated technologies with ones from modern day, it can still be fun to realize that some BD discs can store almost 100,000 times the data that can be put onto a 1.44 MB floppy disk. What Is a Hard Disk Drive (HDD) and What Does It Do? What Is an Optical Drive and Do You Need One in Your Computer? What Are Hard Drive Sectors and How Do You Repair Damaged Ones? What Does a Hard Drive's "Seek Time" (or Access Time) Mean? Why Do Most New PCs Not Come With DVD or Blu-ray Drives?